Ahhh … charlotte. I don’t often see this dessert around in cake shops; but then again its probably coz I am shopping in the wrong kind of cake shop. I know they sell them in French and Italian cake shops. 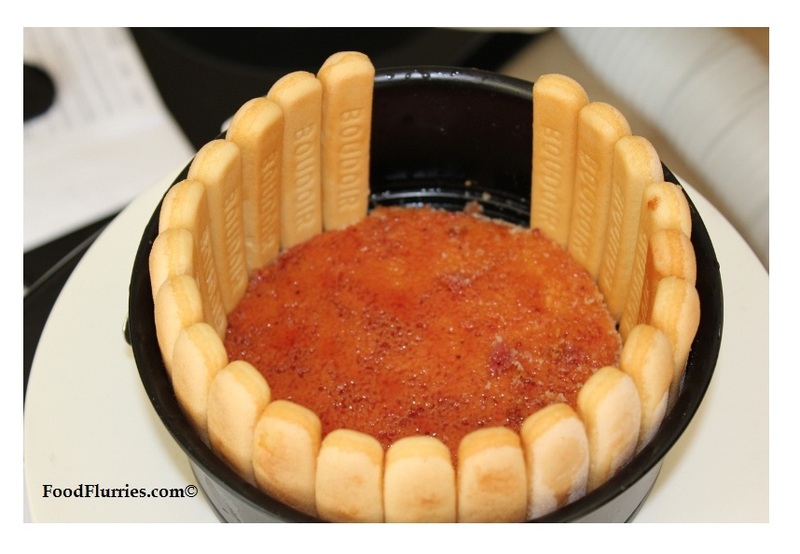 Charlottes are typically served cold with a fruit based preserve or cream or custard filling and lined around the outside with sponge fingers. It is one of those desserts where no baking is required; just get a few simple components ready then assemble one by one to form the dessert. Chill for several hours before serving. The classic version would be just sponge fingers and Bavarian cream, but mine is a more updated version. 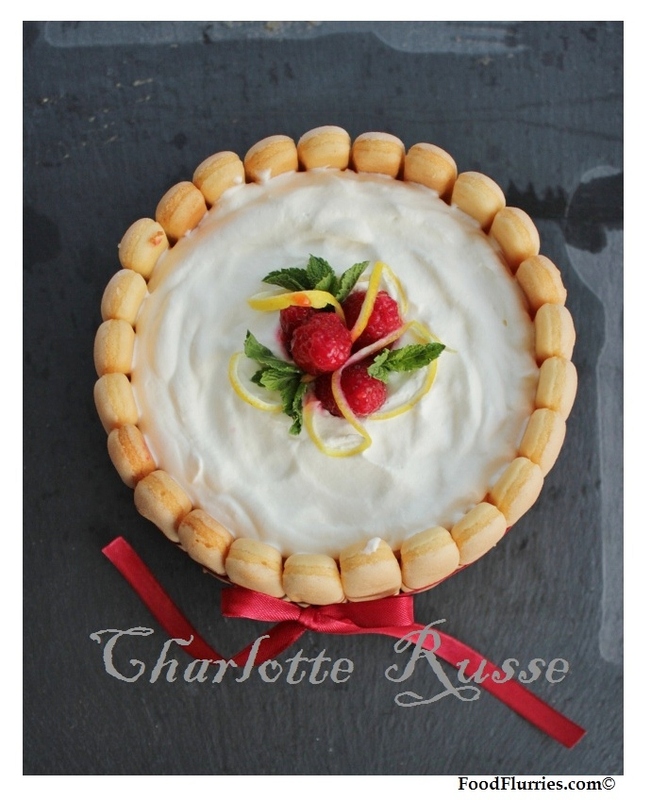 From what I have been reading, it appears that the classic version, called a Charlotte Russe, was first invented by the legendary French chef Marie Antoine Carême (1784–1833) who named the dessert in honour of his Russian employer, Tzar Alexander I. 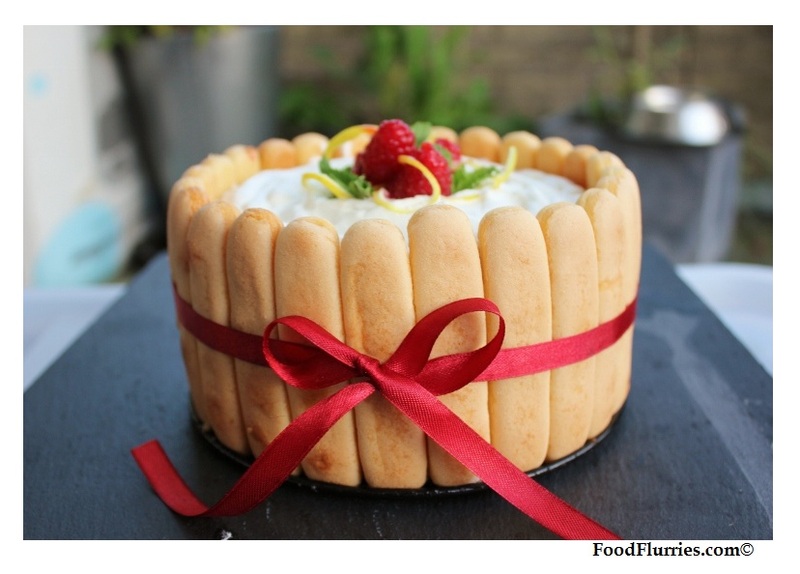 His version was a ring of ladyfingers filled with Bavarian cream in the center. On a more personal note, I know I had a Charlotte-esque cake for my 2nd birthday. I don’t remember it specifically but I have the photos to prove it. I must have Mummy scan me a copy. I don’t think my birthday cake would have been lavishly filled with Bavarian cream tho (in the 80’s, where I come from, Bavarian cream was unheard of) … but I remember it being a pink confection; possibly filled with sponge and jam in the middle and then pink (strawberry flavoured cigar wafers) wrapped with a pink satin ribbon, holding everything in place … more like a cigarello cake. I am not sure if it was store bought but that’s highly unlikely ~ I don’t think my mother ever store bought cakes for our birthdays back in the day. For as long as I can remember she made all our birthday cakes up until the age of 12, bless her heart. They weren’t always professional looking but they were made with love by Mummy, and I will always remember that. So back to my version of Charlotte Russe. 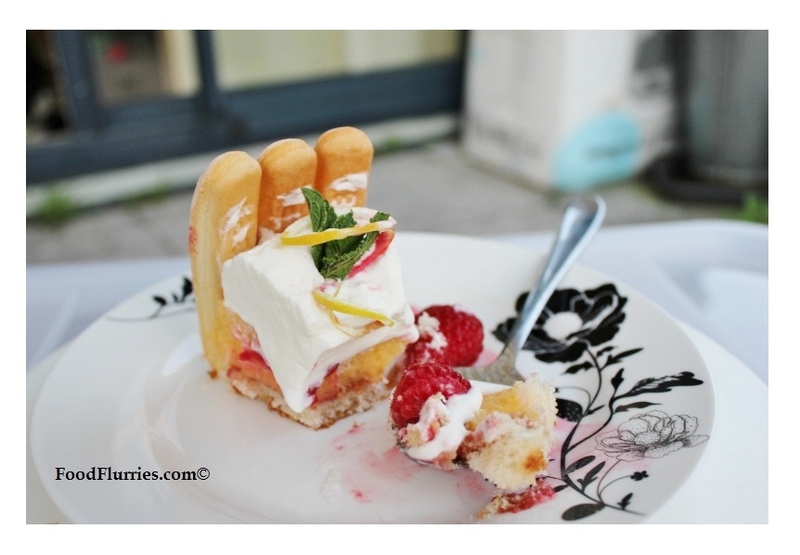 I am doing a Lemon & Raspberry Charlotte topped with Chantilly cream, and held together with a band of ladyfingers dipped in a sugar syrup solution. The base of my dessert is a fairly dry vanilla sponge, which I moistened with a strawberry preserve + ruby port mixture. Assembling this dessert may take two days, simply because you will need to chill the filling sufficiently (preferably overnight) to ensure everything sets nicely. A good ‘make ahead’ choice if you are planning on entertaining guests. To start, I began with making the lemon curd a day in advance. Why lemon curd? Coz R came home one day with two bags of lemons, hinting (not so subtly) that he would like me to make a dessert of some sort featuring lemons. *rolls eyes* Initially I was going to try my hand at a lemon meringue tart, but pastry bases intimidate me, so I went with Charlotte Russe. 1. Get a double boiler going. Then combine the eggs and sugar in a bowl and place over the simmering water. Whisk until the mixture thickens and becomes pale yellow … similar to making zabaglione. Monitor the temperature of the bowl otherwise you risk scrambling the eggs. If done properly the mixture will double in volume. 2. Now take it off the heat and add the lemon juice and cold butter cubes. Stir until everything melts together nicely. 3. Chill in the fridge overnight. The mixture will thicken further once chilled. It will need the addition of some gelatin leaves the next day for it to set properly in the mould. *note : If you don’t like your curd sweet, then simply adjust the sugar amounts to suit. 1. Prep the mould by cutting out some vanilla sponge to fit the tin. Depending on the thickness of your sponge fingers you may need to cut the sponge base an extra 1 – 2 cm smaller to allow room for the sponge fingers. 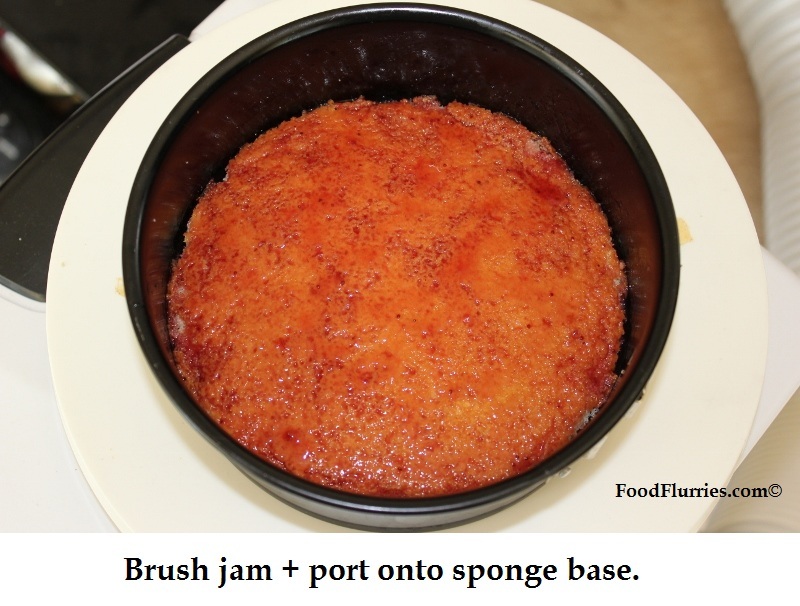 Place the sponge at the bottom of the tin and brush it with a mixture of jam and port. If kids are going to partake then omit the alcohol. Set the tin aside to allow the cake to absorb the liquid glaze. 2. 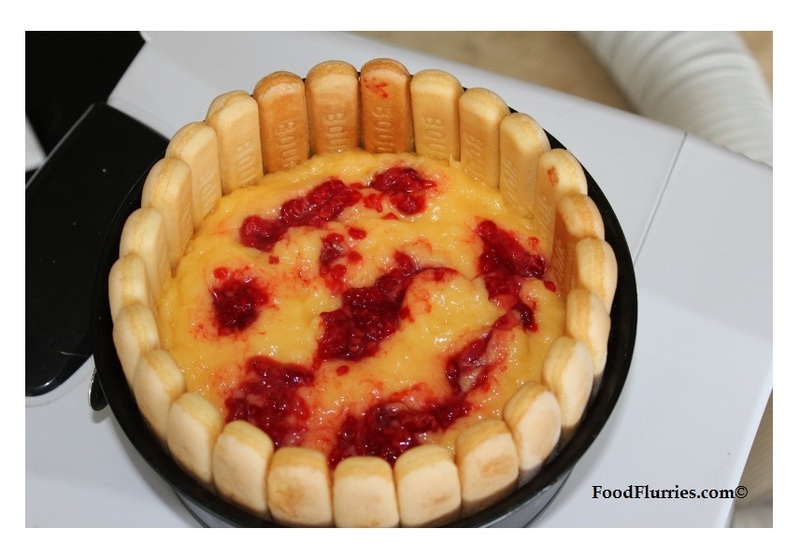 Now arrange the ladyfingers in a circle following the wall of the tin, making sure they are all the same height. Oops … but before you do that you need to lightly immerse the ladyfingers into a sugar solution to soften them slightly. I used 150 mls water + 150 g regular white sugar, 1 tsp vanilla (or you can use a vanilla pod), and about three thick shavings of lemon rind to scent the sugar solution. Reduce slightly then let it cool to room temp. Quickly dunk each ladyfinger into the sugar solution then line the tin. 3. Now fix the lemon curd. Soak the gelatin leaves in a bowl of cold water. 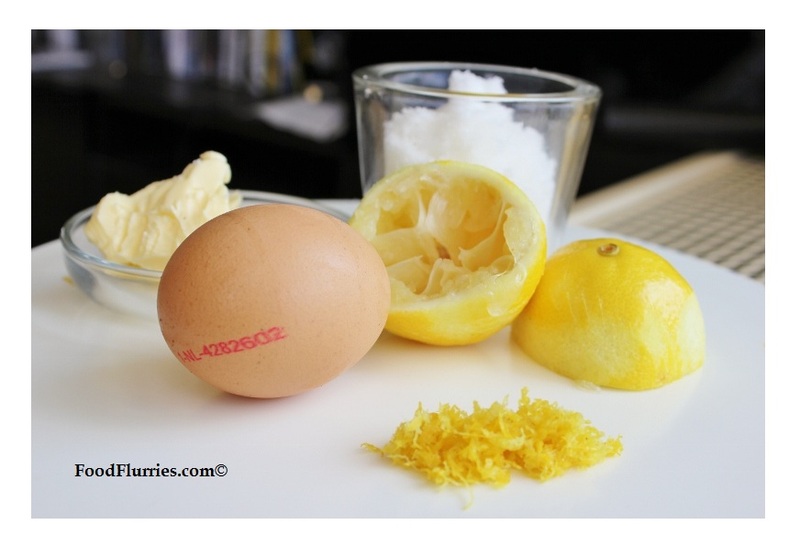 Now squeeze out the juice of one lemon and sweeten with 2 tsps of sugar. Place in the microwave to heat ~ about 2 mins. Remove from microwave and add softened gelatin leaves. Stir thoroughly. Once it has cooled slightly, add to your bowl of lemon curd you made the day before. The mixture will thicken almost immediately so don’t wait too long; pour it into the tin on top of the sponge cake. After pouring the curd I dotted it with macerated raspberries. 4. Place everything in the fridge for about an hour to chill and set properly. Once everything has set you can start whisking up the cream ~ place cream into a clean bowl and using the baloon whisk attachment start whisking on medium to gently incorporate air. When you reach the soft peak stage, add the powdered sugar a tablespoon at a time. Once its all in keep a close eye on the cream; DO NOT OVER WHISK or it will go all grainy … or worse yet, you will get butter. Top off your dessert with the cream (I strongly recommend you be generous in this department) and garnish with fresh raspberries dipped in the sugar solution, mint sprigs and lemon rinds. Serve immediately. If it is a very hot day and your cream is starting to run, chill everything again for about 2 hours before serving. C’était la spécialité de mon père quand nous étions petits: charlotte à la fraise. Pour ses 60 ans, je lui ai fait un dessert dédicace. Vu qu’il adore la crème de marrons j’ai fait une charlotte crème de marron / poires avec une chantilly maison… Super! Thank you for stopping by and checking out my blog, JJ et Brioche. Mais moi aussi, j’aime beaucoup charlotte aux fraises.